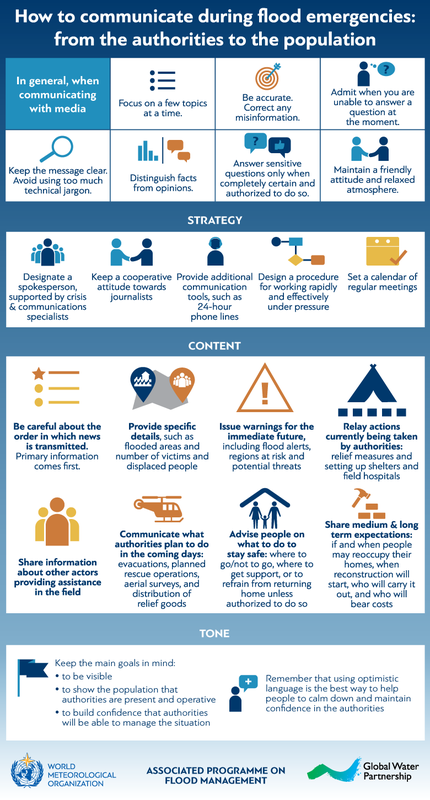 This interactive infographic illustrates good communications practices during flood emergencies, highlighting communications strategy, content and tone, in particular. Click on the pulsing hotspots to learn more about each topic. For detailed technical guidance on this topic, download The Role of Media in Flood Management from the Flood Management Tools Series. Very interesting and informative. I believe there is more to Advising People on what to do that should link into a pre-flood season communication timeframe when people should be advised to prepare flood kits and emergency plans. The Advising People what to do should then include reference to this. I would also suggest the Flood Kits include property level protection products that can be easily and quickly deployed when flood warnings are communicated. Great point, Steven! We touched upon this briefly here but feature a more extensive list of actions in our tool on Community-Based Flood Management here. Do check it out!